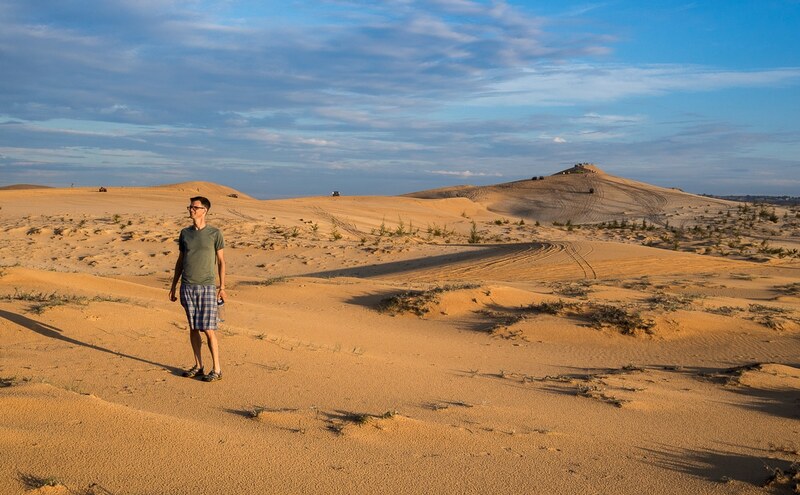 Should You Bother Visiting the Mui Ne Sand Dunes in Vietnam? | My Five Acres. Travel. Adventure. Yoga. Should You Bother Visiting the Mui Ne Sand Dunes in Vietnam? Are the Mui Ne sand dunes a place for a spectacular trip into a wonder of nature? Or are they just a cheesy tourist trap? 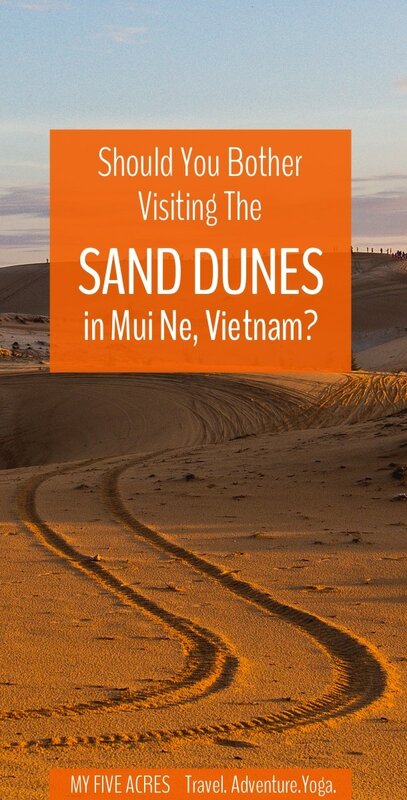 Read on to discover the pros and cons of visiting the sand dunes in Mui Ne. What’s in our Guide to Visiting the Mui Ne Sand Dunes? Mui Ne, Vietnam used to be a quiet fishing village about 200 km east of Saigon. Now it is a bustling beach resort, which attracts Vietnamese weekenders from Ho Chi Minh City, Russian, Korean, and Chinese tourist, and a few backpackers on the Vietnam Open Bus Tour trail. 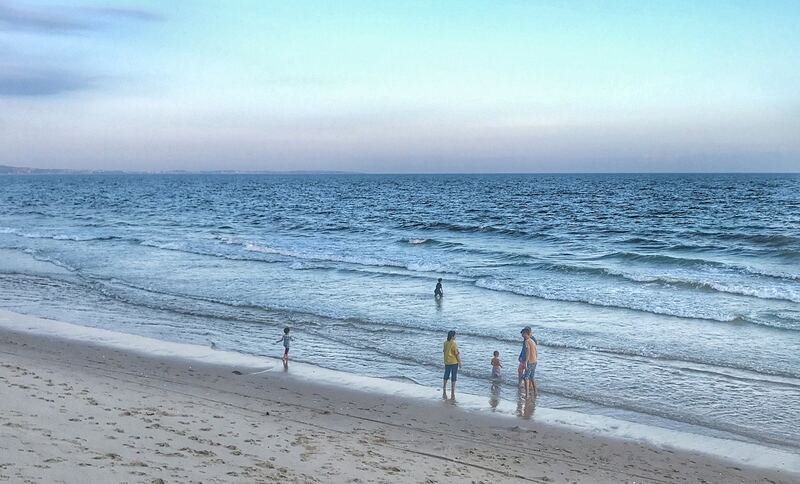 The beach in Mui Ne offers plenty of activity, like kitesurfing, surfing, and SUP. Aside from the soft sandy beaches and all the activities that go along with beach life, the list of Mui Ne things to do is a short one. The other big tourist activity in Mui Ne is a Mui Ne sand dunes tour. There are two sets of Mui Ne dunes: the white sand dunes and the red sand dunes. You can probably guess what colour each of them is! The white sand dunes Mui Ne are a vast expanse of white sand, sculpted into rolling dunes by the ever-changing winds. The red dunes, despite their striking colour, are less impressive. Families with young kids will enjoy the chance to fling themselves down the red dunes on plastic toboggans though. Most people visit on a group tour arranged at their Mui Ne hostel or hotel in Mui Ne and we did the same. But, as we found out, we would probably have enjoyed the Mui Ne sand dunes if we had chosen differently. Should You Bother Visiting the Mui Ne Sand Dunes? Watch our video to get a glimpse of the beautiful sand dunes and find out what to expect from a Mui Ne Sand Dunes Tour. For the best experience of the sand dunes, don’t book into a group jeep tour with all the other tourists. If you do, you’ll be stuck on someone else’s schedule and end up either waiting or feeling rushed (or both). Our tour started with 20 minutes sitting by the side of the road in Mui Ne — before sunrise — waiting for we-know-not-what. The wait meant that the driver careened along the roadways and at dangerously high speeds to get us to the dunes for sunrise. We survived, just, but we also missed sunrise by about 20 minutes! Later, we sat for half an hour at the end of each tour stop, waiting for a couple who decided to ignore the set meeting time and roll in whenever they felt like it. Super annoying! Some travellers swear by their sunrise travel experiences. At touristy places like Angkor Wat, Mount Bromo, and the Mui Ne sand dunes, everyone feels compelled to gather at these appointed times to watch the sun do the same thing it does every single day. 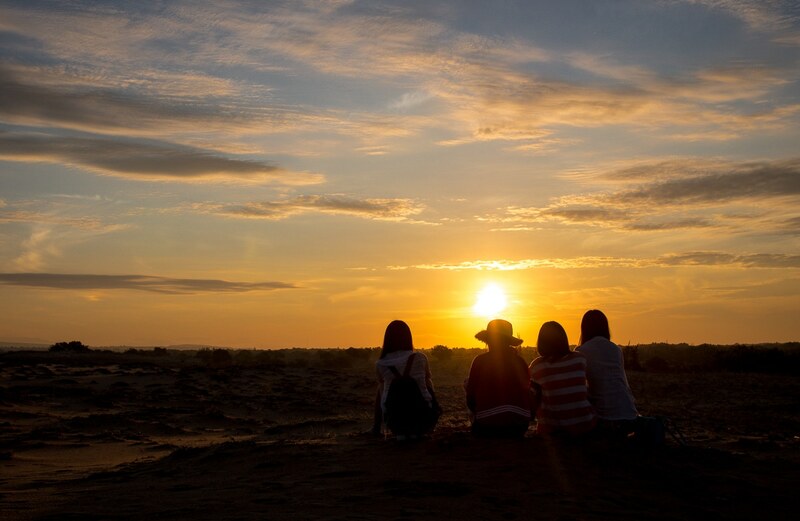 Tourists from around the world come to see sunrise at the Mui Ne Sand Dunes. For us, sunrise and sunset excursions always leave a bad taste in our mouths. Yes, you get beautiful light and dramatic pictures. But you also get thrown together with hordes of other tourists who completely highjack and detract from the experience. I’d rather have a better experience and worse pictures! (I know that attitude is why we don’t have a million followers on Instagram but it’s true nonetheless). Arrive about an hour after sunrise, when all the early tourists have gone home, and you get some of the world’s most impressive monuments to yourself. 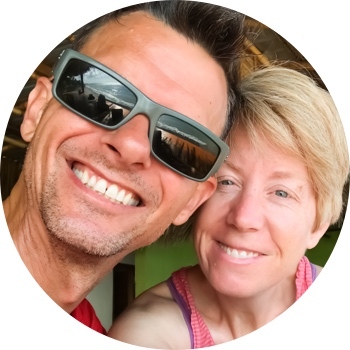 Despite skipping sunrise, we think our photos in both Angkor Wat and Mount Bromo turned our pretty well! A tour to the white sand dunes only costs a few dollars but what no one tells you is that when you arrive at the dunes, just before sunrise, you’ll have to pay an additional $10 for a Jeep to drive you across the dunes to the ideal sunrise-viewing spot. If you like, you can also rent a 4-wheel ATV to rip up the dunes. Jeeps and ATVs tear up the ground at the Mui Ne Sand Dunes. First off, what a scam! You’ve already paid for a tour to the sand dunes and then you have to pay again? No thanks! Second, and far worse, it’s so destructive to the landscape. Plants that live in sand dunes are extremely fragile and crucial to the health of ecosystem. Jeeps and ATVs driven willy nilly by mobs of tourists tear up the dunes and disturb the creatures that live there. Even unrestricted walking across the dunes, like we did, is destructive. We’d love to see better regulations in place so that this kind of thing doesn’t happen. You can help by not renting a vehicle a the white sand dunes and being careful about where you walk. You can arrange a sand dunes tour at your hotel or hostel in Mui Ne, or at any of the many travel agents along Mui Ne’s main street. As you can see in the video, we opted for the easiest and by far the most common option for visiting the white sand dunes — an organized jeep tour. …whereas the fairy stream is pretty, if a little crowded on the weekend. You can either take a group tour or a private tour to the white sand dunes. A group tour is for up to 6 people and costs between $3-10 USD, depending on where you book. Most of the Jeeps are well-maintained and comfortable. Ours was an old clunker, which was in serious need of a tune-up. If you have a smog mask, bring it! A private tour will cost you about $20 per jeep (with driver). Though we went with a group, we soon wished we’d opted for the private tour, since we spent almost as much time waiting for our fellow tourists as we did seeing the sights. On a private tour, you can also decide what time to go. The Mui Ne Sand Dunes are touristy but it’s possible to find a peaceful spot. Though sunrise gave us beautiful light at the dunes, it also meant that we were packed in with other tourists for the duration — not our favourite way to travel! 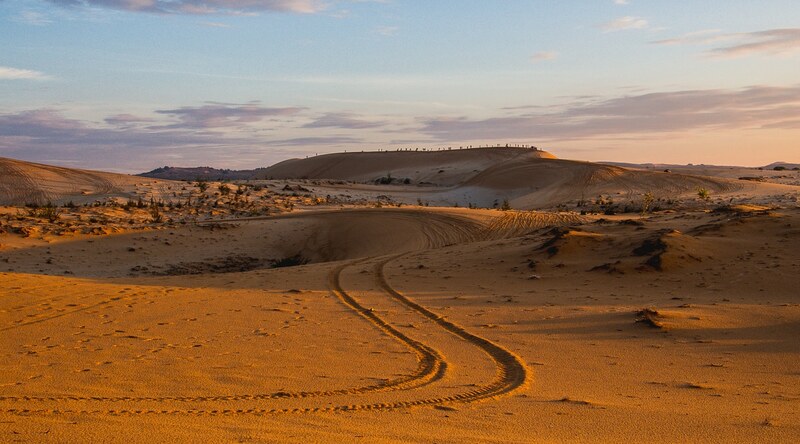 Motorbike rental in Mui Ne costs about $8, so if you can drive one, this is your best option for visiting the dunes. That way, you get absolute freedom to wander where you want when you want. Be careful though, as we have heard awful stories from locals about the hazards of the main road through Mui Ne. You can also hire an “easy rider” motorbike, meaning you ride and a local drives you. I wish we’d gone for this option! The Verdict: Should You Visit the Mui Ne Sand Dunes? Unless you’re in Mui Ne for a week or more, or you’re a sandscape fanatic, you can safely skip going to the Mui Ne sand dunes. There’s more than enough fun to be had on the beach, in the water, and poolside to keep you occupied in Mui Ne. 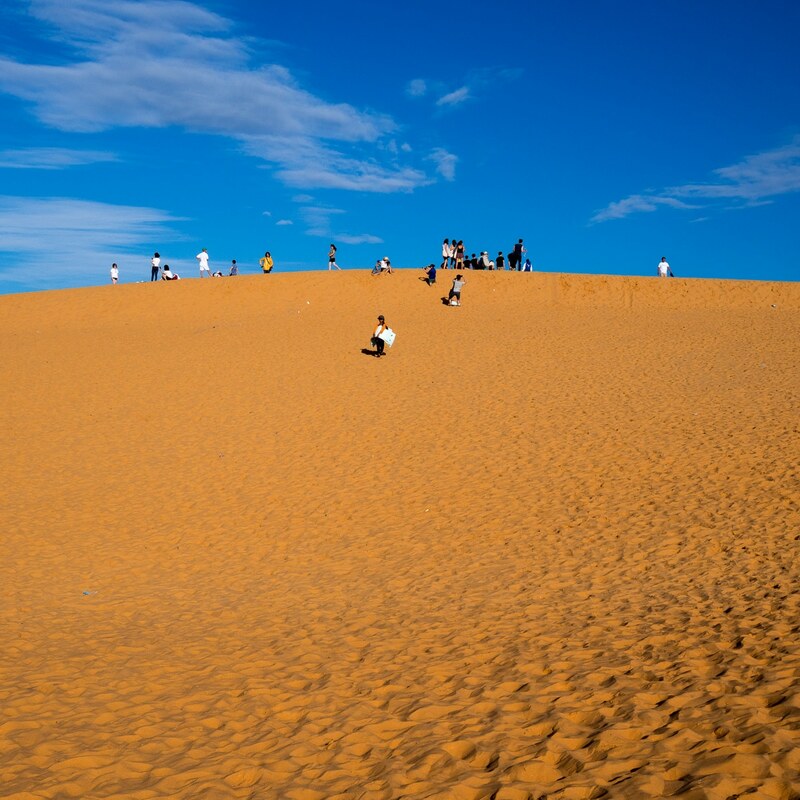 If you’re travelling with kids, just visit the red sand dunes in Mui Ne, which are more fun and much easier to get to. The Red Sand Dunes Mui Ne are best for family fun. If you do decide to visit the Mui Ne Vietnam sand dunes, follow our tips above for the best mindful travel experience! The fastest way to do the Mui Ne Saigon route is by private transfer, though it is also the most expensive. It will cost you about $80 for four people, so can make sense if you’re travelling with a group. For a mid-price journey for fewer than 4 people, take the train. It leaves around 4 times per day and takes about 4 hours. Train tickets cost around $23. The problem with the train is that you will need to arrange transportation between the train station and your hotel on both ends of the journey. The cheapest (and most adventurous) way to get between Ho Chi Minh City and Mui Ne is by bus. Depending on the bus company you choose, the ride lasts between 4 and 5.5 hours. The busses are sleeper-style and relatively comfortable, so you can stretch out and enjoy the ride. Tell the bus conductor where you are staying in Mui Ne and they will drop you off in front of, or close to, your hotel. To book any of these transportation options between Mui Ne and Saigon, just ask at your hotel. It’s easy to get to Mui Ne by bus from Ho Chi Minh City or from Nha Trang, a short distance to the north. Busses drop you off on the main street of Mui Ne. Just tell the driver or assisstant where you’re staying and they’ll tell you when to get off. There’s also a train from Ho Chi Minh City to Phan Thiet. From there, you’ll have to take a taxi to your hotel in Mui Ne. Use 12go.asia to search for transportation options and book your trip to Mui Ne. Some of the links we’ve provided above are affiliate links. That means that if you use one of the links to book tours or hotels, we make a tiny commission at no extra cost to you. So please use our links! You’ll be enabling use to keep creating the best travel advice we can provide. Very cool! Glad you enjoyed it and found a way to have a better experience than we did :). Ha ha. I think we should make it a sport to cast unwanted shadows in Instagrammer’s photo shoots. Wait, is that mean? Or just helping them develop their Photoshop skills? Thanks for you comment! Made my LOL this morning. great tips and photos you have there. will keep it in mind for travel next time. Great perspective on the dunes visit. It is always a tough call on whether to battle the crowds for that epic shot, or go through an enjoyable and more private experience by switching gears. I also love that you mention the sustainability issues that sites like this go through. It’s so often overlooked. More and more, we see people who travel just to get the perfect Instagram shot. While there’s nothing wrong with taking travel photos, I do wish people would remember to actually experience the places they’re visiting too! I didn’t know Vietnam had sand dunes. It looks amazing on your post. And too bad about the waiting part. I would have been annoyed too if it happened to us. We do try to be patient when things like that happen but that early in the morning after not getting enough sleep, we were a little less able to control our irritation! Your video answers your questions… of course you should visit! :-) Seriously, it does look like a great experience… given what you say about waiting for other tourists (how frustrating and inconsiderate), I think I’d definitely opt for the private tour. It’s funny that other tourists are often the worst part about travelling, isn’t it? But yeah, the dunes are pretty beautiful. 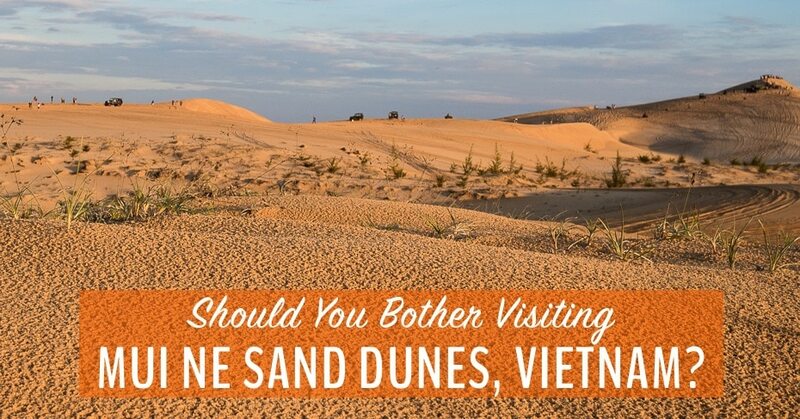 I have never equated Vietnam with sand dunes, so this post really made my eyes go wide. You made some appreciable points about preserving the area by not renting a vehicle and being careful about where to walk. Rising tourism does take its toll, and we need to be extra conscious about how deep a footprint we are leaving. I have been feeling this more and more as we travel through Asia, where there is generally less emphasis on environmental preservation. We try to do more good than harm as we travel but sometimes I’m not so sure that the equation adds up. I know, right? I think most people don’t know it’s here until they get here! 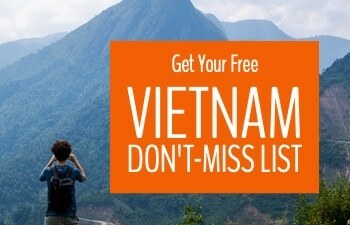 I feel really stupid because for some reason, I thought Vietnam was all jungle. I had no idea there were any sand dunes there. What a fun and interesting place to visit. Loved your photos, too! Ha ha. No need to feel stupid. No one knows everything about everywhere! I’d guess that most of the world’s population pictures jungle when they picture Vietnam. But the beaches and the mountains are fabulous too! The private tour definitely sounds more worth it. And while I don’t normally get up before dawn for ANYTHING- I will do it for sand dunes. The shadows are killer. The shadows and the light are amazing at that time of day. That’s why the white dunes looks orange in the pictures. We’re much more inclined to see sunrise in natural places, like dunes, mountains and forests, than we are over man-made structures! 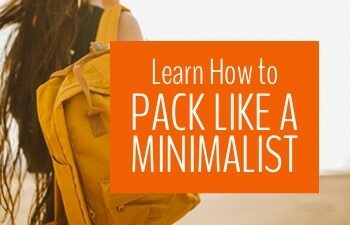 Hmm, I always was not going to read this… I don’t like the “Is it worth it?” approach to traveling. You travel or you don’t. Anywhere you travel is worth it. It’s a mindset, not a check list. 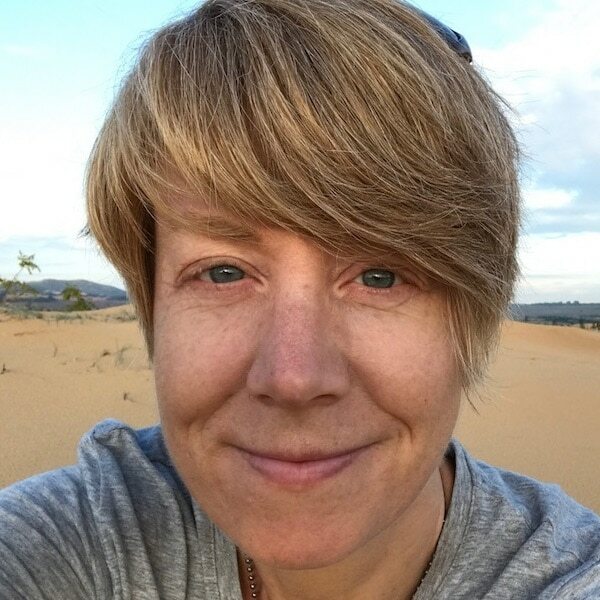 With that off my chest: I love your pics of the dunes and thank you for the reminder about the dunes being a fragile eco system we should try our best to respect. I love that perspective – that travel is what you make it so no place is “not worth it”. Thanks for reminding us of that. Though, for most people, travel also has strict time limits and they need to weigh the pros and cons of different attractions. I like to help them do it where and when I can!